I let my mind spiral out of control. I let my attitude go into the toilet. I end up a stinking mess in my relationships and circumstances. I sulk around with a stinking attitude. I’ve learned that following that frustration and anger script leads to no good. I’m not fun to be around, and I treat others horrible. It reflect God’s nature, and I usually feel worst not better. Stay out of it. I don’t have to join every fight that I’m invited to. Control my words. I can be the adult and hold it in. God has a good plan for your life. God is fully capable of meeting each and every need you have … He often just does it in ways you don’t expect. God is fully capable in dealing with our stinking attitudes. Of course we can know a lot about God, but we still do not know how to pray. Instead of suggesting quiet times or journals as the “answers” to effective prayer, we need to go deeper than that. Pray with a pure heart. As you seek a pure heart, repent of your sins. God will not listen if your heart and mind is full of sin. Ask God to give you a pure heart. God’s Word says that once you ask for forgiveness it’s like those things never happened. They’re gone for good. 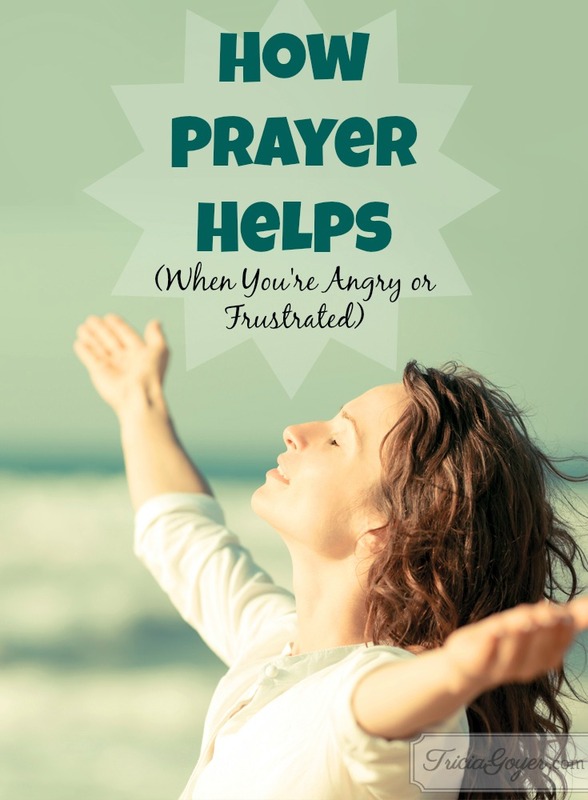 Why do you want God to answer your prayers? If you WANT something because you’re being greedy, or for pleasure or ease … you probably won’t get it. But if you are praying for God’s will than everything changes. When you pray, are you praying according to the Bible: for others, for peace, for joy, for love? Are you praying to know God better? THESE are the prayers He loves to answer. When you pray with trust you don’t have to handle it all on your own. We need to trust that God is listening to our prayers. We need to wait patiently, and know the God’s answers will come in God’s perfect time. One Scripture that I turn to often is Psalm 37:7. Waiting patiently means believing that God loves you completely, and He will ALWAYS do what is best for you. When we allow frustration and anger to overwhelm us—and when we try to handle things with on our own—we end up with a stinking attitude in stinking circumstances. Yet when we turn over our frustrations to God with a clean heart, pure motives, and pure trust, God will show up and change you from ways you can’t imagine … starting from the inside out! That’s something we can all look forward to! 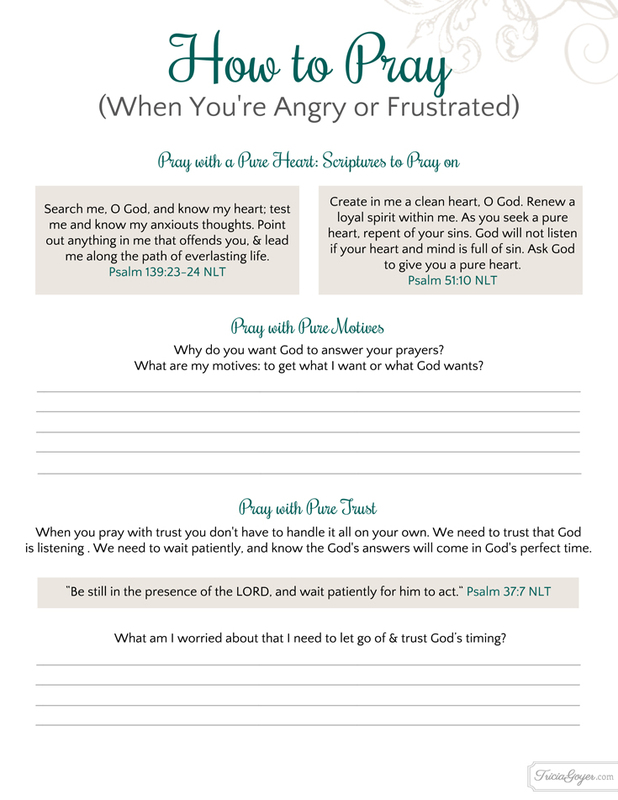 Download the printable and keep nearby when you find yourself angry or frustrated! Hi, Tricia. I’m a new follower and I really enjoy your blog. I’ve spent a lot of time re-thinking my approach to prayer over the past year. In May 2014, I lost my dad in a car accident. I’m in my 30’s and that was my first major loss, so it hit me pretty hard in the faith department. Thank you for these helpful reminders… and it’s nice to know I’m not the only one who struggles with stinky attitudes on tough days! Thanks for sharing! Blessings to you, Lisa! So hard! Thank you Tricia, this was very helpful on a frustrating morning!